My cat has been diagnosed with severe IBD (8 weeks ago). Lymphocytic, Plasmacytic, Neurrophilic and Eosinophilic. My cat has been diagnosed with severe IBD (8 weeks ago). My cat has been diagnosed with severe IBD (8 weeks ago). Lymphocytic, Plasmacytic, Neurrophilic and Eosinophilic. Biopsies via endoscopy didn’t show SCL but we aren’t 100% sure it’s not there given they weren’t deep tissue biopsies. At time of Ultrasound and Biopsy there were no tumours or lesions seen and her lymph nodes weren’t enlarged. The endoscopy was only upper GI. Her core symptoms were weight loss, persistent vomiting and loss of appetite/lethargy. After trying diet change to a single protein and antibiotics without response she was put on Prednisolone 38 days ago (10mg daily / 5mg x 2). The vomiting has stopped and she has regained most of the weight she lost (she lost 1/4 of body weight pre Pred). She is still very withdrawn and lethargic, after eating she literally sprawls on the floor, eyes open, staring at the wall for 12 hours. Has gas and looks very uncomfortable. Switching her diet again (to a turkey/rabbit mix from lamb) has reduced the mucus in her stool and so far they are becoming more formed (she never had diarrhoea but her stools were half formed/half mush) but behaviourally she isn’t in a good way.She has her check up with the specialist who said on stomach exam he could still feel the inflammation (“it feels like little hard pipes”) so whilst Pred has tackled some of it, he thinks she needs a change in treatment.I was given two options:1) try switching to Budesonide to see if it works better on the inflammation and helps with any of the side effects from Prednisolone (he said that whilst the lethargy/depression isn’t a standard reaction to it - he has had multiple owners state that the Pred had resulted in that behavioural change and either lowering the dose or switching to Budesonide had helped resolve it a bit)2. Remain on the Pred and introduce Chlorambucil on a 4/17 cycle.I have to decide by tomorrow and whilst I appreciate you can’t advise me on the route to take I do question.If switching to Budesonide tomorrow - should we be giving her both for a while to taper the Prednisolone or just switch directly? There seem to be two schools of thought on this and would just appreciate your view. did your vet mention triaditis? IBS is an opportunist disorder.Even though her fPLI was normal I suspect triada and would treat accordingly. Triaditis refers to a syndrome of concurrent inflammatory diseases of the liver, pancreas, and small intestines in cats. Veterinarians believe that the initial symptoms of Triaditis are due to liver disease (cholangitis), with pancreatitis (inflammation of the pancreas) and inflammatory bowel disease (IBD) being secondary. However, some cats may first develop IBD, then pancreatitis and cholangitis. Feline anatomy is the likely reason these 3 inflammatory diseases occur simultaneously. In cats, the liver's main bile duct and the pancreatic bile duct share a single opening into the small intestine (duodenum). Additionally, the feline duodenum is believed to have 100 times more bacteria than the canine duodenum. Therefore, a cat's vomiting may cause bacteria-laden intestinal fluid to move into the pancreas and the liver through this common opening, which can cause inflammation and bacterial infection in the liver and pancreas. Cats suffering from Triaditis may display lethargy, anorexia, vomiting, abdominal pain, weight loss, and diarrhea. However, some cats may show no symptoms. The best food for IBD is royal canin, optimum fiber. She must take denosyl or denamarin to heal herliver. Rub a drop of honey into her gums to raise her blood sugar when she is hypoglycemic. Sudden reduction of carbs in a diabetic cat can cause hypoglycemia. Her weakness and lethargy can be caused by hypokalemia, which is low potassium. Diabetes in cats is caused by a dry food diet. Unlike people, a diabetic can can reverse after being switched to wt food only. Please let me know how she does on this program. I hope this information has been helpful. I will be standing by if you have other questions. Let me know if I can help further. Also, before signing off today, please take the time to use the star rating system at the top of the page to leave a rating for me (bottom of the page if using the app). A 5-star rating is appreciated as top notch answers are my focus. If you feel you have received anything less, please reply so that I may help until you’ve received the assistance you need. Until you issue a rating, the website will not compensate me for helping you. You will still be able to chat with me even after issuing a rating at no further charge on this thread. Thanks Terri for all this but regarding the actual question of the switch from Prednisolone to Budesonide - is there a standard protocol? 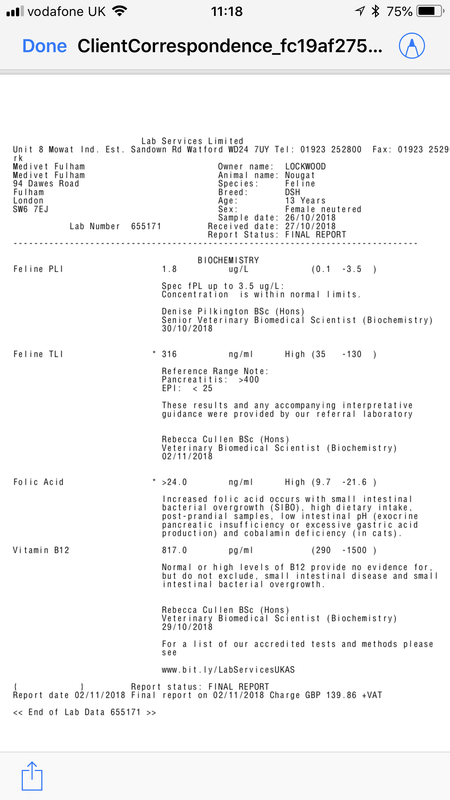 That was my main concern as there seem to be many different routes and I was looking for an opinion of whether it’s better to taper Pred whilst starting Budesonide or to just switch with no crossover.I’ve taken on board what you’ve written re Triadatis and will ask the IM vet about it given the points you’ve raised but do you have an opinion on the steroid switch? Budesonide is listed as an anti inflammatory steroid that is specifically targeted at the GI tract so I don’t understand your comment above. All I was asking for was advice or an opinion on how to switch from One to the other. Thank you for all this but it hasn’t really helped me. Hi, my name is Rebecca. I am veterinarian with over 30 years experience. I just came online and saw your question about switching from pred to budesonide in your cat with IBD. I myself would try the budesonide first. The protocol I follow is to taper off the pred while starting the budesonde over 2 weeks, so that in 2 weeks you are using the budesonide only. I would save the chlorambucil as a back up/next step if the budesonide does not help. I have had pretty good luck with budesonide myself, some cats do not respond to treatment as well as others. Thank you so much for your reply - your reasoning is exactly mine, I wanted to see if the Budesonide could resolve the issues as it’s targeted for the GI before resorting to Chemo. I will admit I am terrified about switching as the Pred has at least stopped the vomiting and countered the weight loss, but she just seems so permanently miserable and listless. I know this can be the disease not under control rather than the Pred but it’s so hard to know what to do. You mentioned you’ve seen some good results with Budesonide - out of interest weee the cases of IBD mild or severe? I know that it’s going to be trial and error I just hate that my cat is the guinea pig...thank you. Genuinely! You are welcome. I would try budesonide in my own cat before the chlorambucil. I have seen results in cat that had severe IBD. My own cat has this condition, but it is mild, and he does so well on 2.5 mg prednisolone every other day that I have not yet switched him to anything else. Every case, every cat is different, so it is hard to predict whether it will worked based on the severity of the IBD, so I would give it a try. Please let me know if it helps, and how she is doing. Thank you so much. And thank you for the advice on tapering. I am assuming if the Budesonide isn’t effective as the Pred I will know soon enough? And I’m so sorry to hear your cat also has IBD it is proving to be a confounding disease... if I may, as I go through this process I may have more questions for you (I will obviously ask them as separate questions so you get paid for them!) but is there a way I can come back to you and not another vet? Yes, you will know once she is on budesonide alone if it is working or not. You can always request me if you start a new question, "For Rebecca only". You can also pick up this thread again by going to My Questions on the website, even after rating my answer. My goal is to provide excellent service; please let me know if you have other questions. Kindly consider rating my answer, to notify the website that I assisted you. You can ask other questions and get back to me on this thread or with updates after rating. ​Thank you for using our site. Are the Budesonide capsules basically the same as the tablets?